The Quarter Parish Church is a congregation of the Church of Scotland. The Church serves the village of Quarter and surrounding area, as well as a portion of Hamilton South. It is a linked charge with the Hamilton South Parish Church, that is: the two Churches share a minister [LINK to Hamilton South Church]. The Quarter Parish consists of about 1200 people and the Church Members number 107. The church operates under the national Child Protection Policy of the Church of Scotland. The Minister is also Chaplain to the Quarter Primary School and takes services at the Duchess Nina Nursing Home. The quarter Parish Church has served the community for 120 years. As a congregation of the Church of Scotland, the Church offers ministry and care to every person residing within its Parish boundaries. The Church has 13 Elders who serve the Parish in Districts. Any enquiry relating to care from the Church may be addressed to any of the Elders or to the Minister. The Church building was erected in 1884 and the Church Manse, on the same property, was built in 1903. Situated prominently at the head of the village the church was built using local stone from the nearby quarry and opened for public worship at the end of 1884. It is now a listed building. 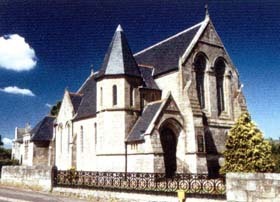 The parish was a portion of the original parish of Hamilton and religious services were previously conducted in the Old Work's School, which dates from 1857. 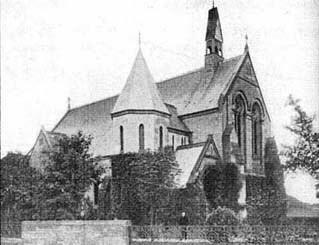 The parish was formally erected and endowed in 1901. The church, which was built to the designs of Mr. J.B.Wilson of Glasgow at a cost of £2300, is Gothic of the early decorated period and contained many pieces of fine workmanship, particularly the large traceried east windows and arched porch of dressed stone. Internally the church was roomy and commodious, providing seats for 420 persons. Behind the pulpit was a fine chancel arch of dressed stone. The pulpit itself was richly paneled and the communion table and chair were beautifully made in pitch pine. There was also a fine font of Caen stone, the gift of a friend of the church. Vestry Session house and hall made the accommodation complete and the whole building was lit by electricity. The exterior of the church was noted for the beautiful way in which the grounds were laid out with trees and shrubs and also for the roses, honeysuckle and jasmine which adorned the walls. Adjoining the church is the manse, which was built in 1903 by the same architect and is at once artistic and comfortable with the church. Over the years with the decline of the coal industry the population fell and a linkage was formed with Hamilton South Church in 1956 with the Rev Joseph Hardie as Minister. In 1982 a fire destroyed much of the Quarter Church, but due to the determination of the congregation, villagers and farmers, the Church was rebuilt and rededicated in December 1984 in time for its centenary that month. The beautifully carved chancel furniture came from St. 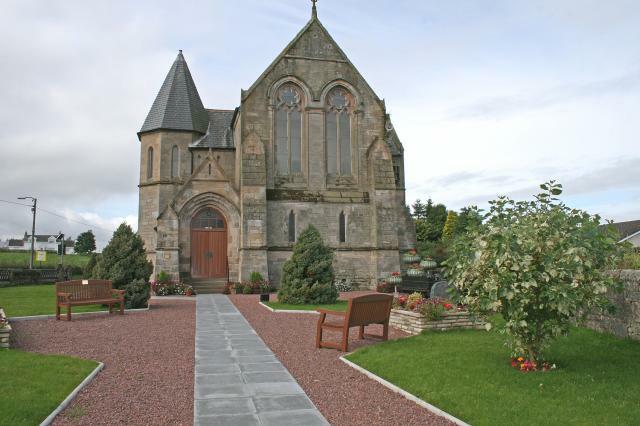 Brides Church, Helensburgh, one of whose former Ministers was the father of John Logie Baird the inventor. Now surrounded by a more residential village the Church sends out a warm and friendly welcome with a variety of activities in a growing community. On Fridays there is the Friendship club giving a warm welcome to all members of the community who would like to come along to the Church on Friday lunch time, for a chat or card games and a bit of lunch. The Friendship Club meets on Friday between 12.30 - 2.00 pm in the Church Hall at Quarter during the school terms. The members enjoy a "lite lunch" provided by willing helpers, followed by "chit-chat" or games. Summer outings are also organised to such places as garden centres, pantomimes, as well as having Christmas Lunches and Burns Suppers. For anybody in Quarter who would like to meet other people in Quarter, why not go along on Friday lunch time to the Church and see what is going on. All are most welcome. The Quarter Parish Church Woman's Guild was formed as a natural progression from a Knitting Circle formed during World War Two to knit for the troops. Affiliation to the Church of Scotland took place on 3rd February 1948 and fifty years later a "jubilee Dinner" was held on 3rd February 1998 at the Silvertrees Hotel in Bothwell. Over the years membership has fluctuated between 20 and 30 people. a lot of money has been raised for church and for various good causes, based locally, nationally and abroad. The aim being to do this in an enjoyable, educational and friendly manner in a Christian environment. The word "Woman's" was dropped from the title of the Guild in 1997, following lively and often heated, debate. The object being to allow men also to join the Guild. The local Guild is answerable to (a) the Kirk Session, (b) the local Presbytery Council which in the case of Quarter Guild is the Hamilton Presbyterial Council, and (c) the National Offices of the Guild under the auspices of a National Convener, located at 121 George Street , Edinburgh , EH2 4YN . Local Council rallies are held twice a year and a National Rally is held annually. A syllabus is drawn up for each session and each Guild has "Open Nights" as well as a "Hospitality Night" when representatives of other Guilds are invited to join their meeting. The Church of Scotland operate Boards and Committees for Social Responsibility, National Mission as well as for World Mission. Although now officially under the jurisdiction of the Session, these matters depend on the Guild for their operation. One young man at last year's National Rally referred to the Guild as a 'surrogate mother of the parish'. Office bearers are elected annually at the Annual General Meeting. 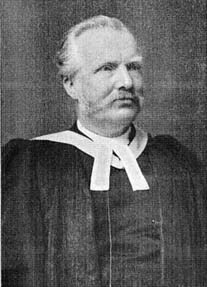 The Rev George Blair, M.A. was the first Minister of Quarter Parish and was a native of Dalkeith. He was educated at the Free School in Dalkeith and Queen Street Institution, Edinburgh. He graduated at the Edinburgh University and attended the Evangelical Union Theological Academy. Afterwards he became minister of the Evangelical Union Church at Sanquhar. Returning to Edinburgh University he completed his education at the Divinity Hall with a view to the ministry of the Church of Scotland. He was afterwards appointed assistant to Dr. Stevenson of Dalry, Ayrshire, where he received valuable experience under that able minister of the Church of Scotland. He was ordained at Quarter at Christmas 1881 and celebrated his semi-jubilee in 1907, when an opportunity was taken to present him with many valuable gifts as evidence of the appreciation of his worth as a minister and a man. During his ministry the church had been built and endowed, along with the manse. Attached to the manse was a well laid out garden where Mr. Blair delighted in spending a portion of his time. For many years this man in our secluded little village had "allured to brighter worlds and led the way." In rain and sunshine, he has been with his people. He was with them heart and soul in the rejoicing at the opening of the Duchess Nina Institute and he was with them in every disaster and affliction and in a mining village there are many disasters and afflictions. At the great railway disaster in 1899 Mr Blair was present from first to last. He was not only a source of comfort, but his knowledge and practical turn were of the greatest material help. Under all conditions you met the same kindly, thoughtful, unostentatious minister of Quarter and everybody, to whatever class belonging, found him the same. His door opened the same, to all visitors, to Quarter. Mrs. Blair, who took a great interest in her husband's work and was held in great affection by the villagers of Quarter was a native of Kirkconnel in Nithsdale and is descended from a noted covenanter's family called Laing who inhabited Blagannoch for 400 years. She was a great-granddaughter of the "Patriarch of the Desert" Robert Laing of Glenmuirshaw, and suggested to Dr. Simpson "The Traditions of the Covenanters". Her grandfather was John Laing of Gillha a noted temperance reformer. The People of Quarter were shocked on Wednesday 6th May 1982 when the 100 year old church became a smouldering shell following a blaze. There were no suspicious circumstances surrounding the fire, with police indicating that tarring work being carried out on the roof of an extension to the building was the source of the blaze. There were hopes that insurance payments would cover the cost of rebuilding and Hamilton Presbytery had pledged support, but whatever, it was clear that Quarter was determined to get its church back. Session Clerk, Mr.Donald Angus tried to sum up the spirit by saying "Everything is still obviously up in the air so far as exact costs and rebuilding plans are concerned. However what is encouraging is the fact that the whole village seems to have rallied around in the past couple of days. Church members and non church members, people from other denominations have all come forward and volunteered their help in clearing the debris. Everyone seems to realise that the village just wouldn't be the village without its church." On June 6th 1982, it was reported that the fire which ravaged Quarter Parish Church in April caused between £250,000 and £300,000 damage and work on restoring the building, which lost its roof in the blaze, was expected to start soon, which was good news for the village as people continued the massive clear up operation and Last week they tackled the toughest operation yet, bringing the 125 year old bell to safety and removing the pulpit from the burnt out shell. A crane was hired and carried out both tasks with the help of John Baird, Harold Harris and Tom Willan. 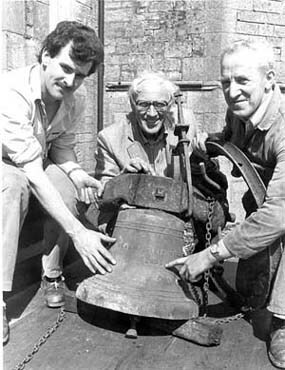 The bronze bell, made at Quarter Ironworks in 1857 according to an inscription fell from its hanging during the fire and was resting precariously on the east nave wall. It will be stored until restoration work is complete then re-hung. Like the cross and bible, the pulpit, thought to be the same vintage as the 98 year old church, survived the blaze intact. It to will be stored and used again. Parishioner Tom Willan, one of the clear up team said a firm of Hamilton architects were surveying the walls of the church to ensure they can stand the weight of a new roof. He also confirmed that the £20000 extension was undamaged by the fire and that the congregation were worshiping in the Quarter Primary School. Since the fire there had been an increase in the turnout for church. Quarter Church opens its doors on Sunday 16th December 1984 for worship for the first time in over two years. The service of dedication was to be a doubly welcome occasion for the congregation, as their centenary was just two weeks later. Quarters minister for 10 years the Rev.Ben Johnstone said "I am very happy that the work to rebuild the church is almost completed. After the fire the only items completely undamaged were the Bible, the pulpit and the cross in the chancel area. We thought this was quite significant and it gave us encouragement for the future and we feel that in expressing our gratitude to those who have helped we should also be grateful to god for the inspiration he has shown us."